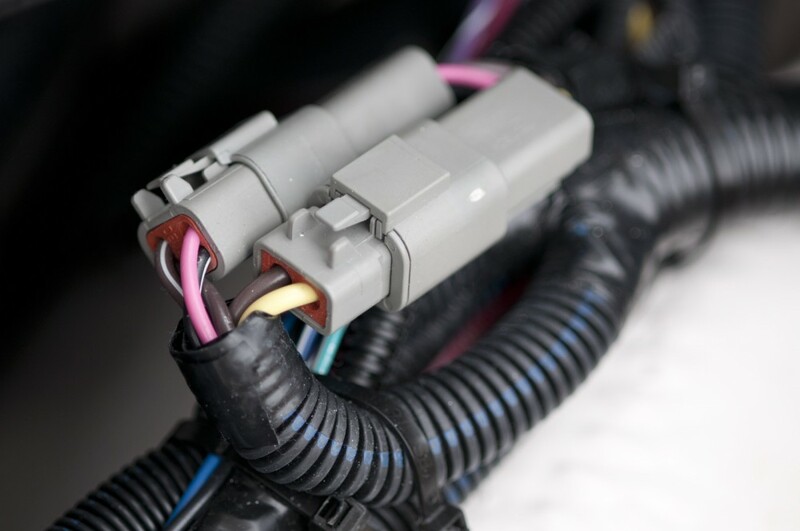 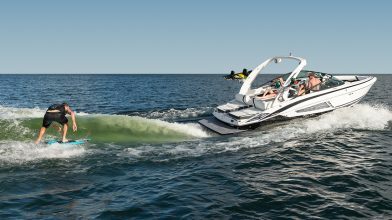 The LS4 Surf harnesses the power and potential of cutting-edge technology to deliver exceptional performance with every wave. 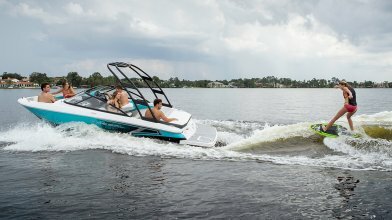 With a newly improved and innovative surf system, you have the ability to adjust speed, trim, ballast at your fingertips while enjoying luxury, versatility, and function in every element of its design. 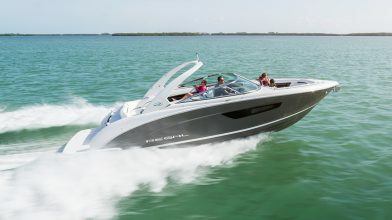 Luxurious style with powerful and precise performance. 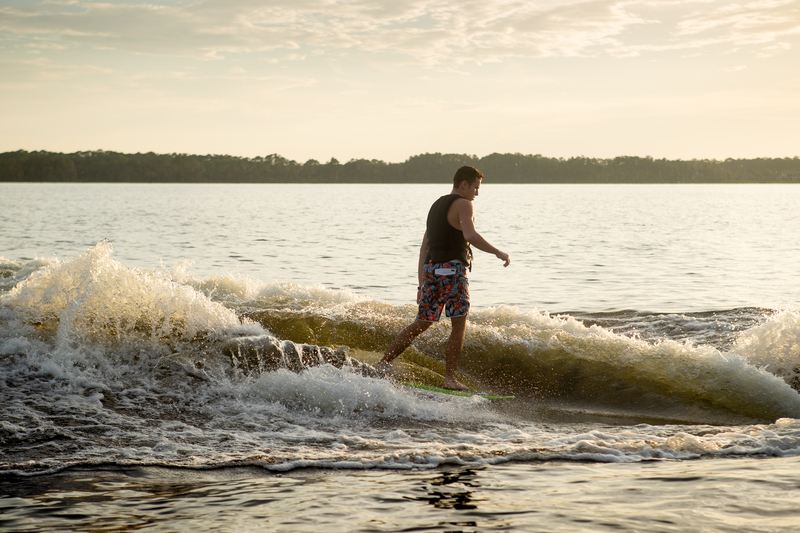 Take your summer to the next level. 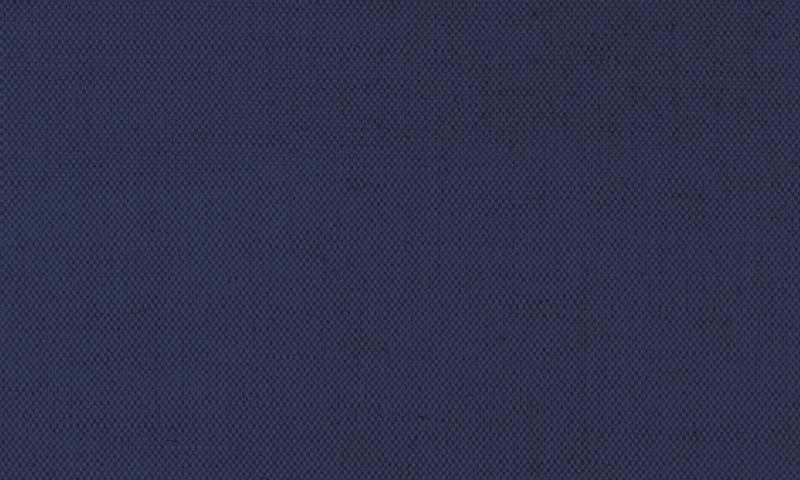 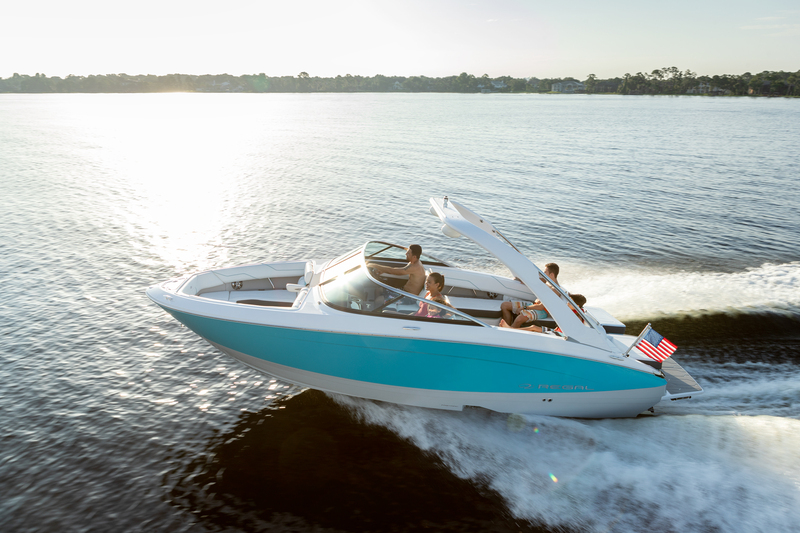 The LS4 Surf featured in Bimini Blue and Steel Gray. 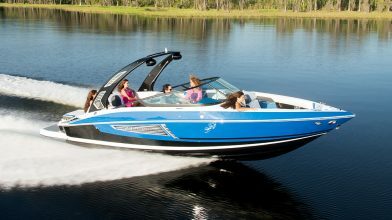 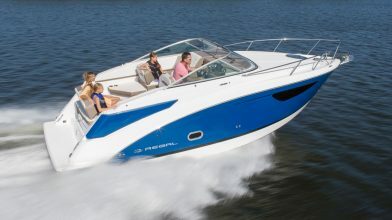 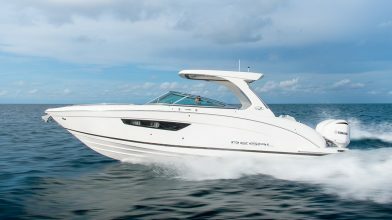 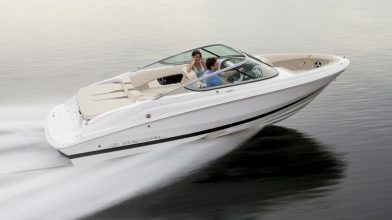 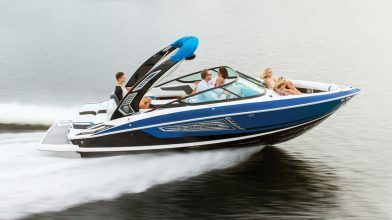 You will find thrill while enjoying premium comfort, luxury, and space on the LS4 Surf. 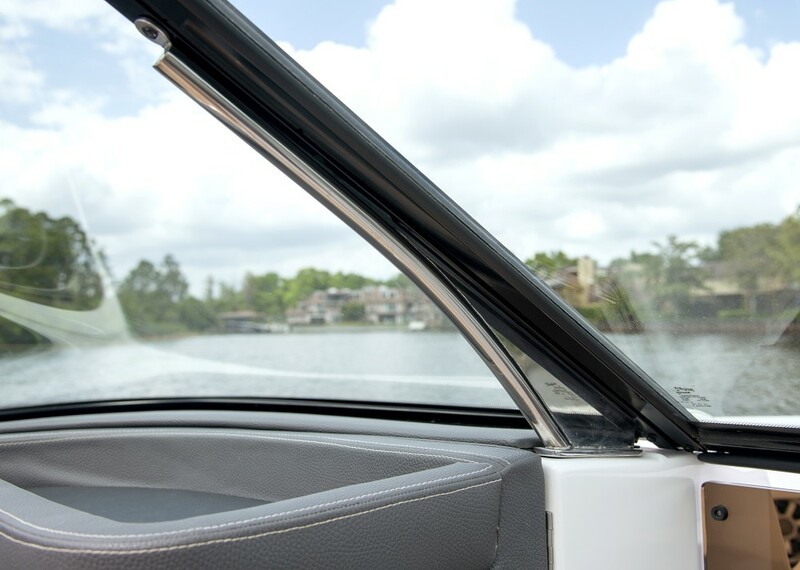 Whether you’re seeking leisure or adventure. 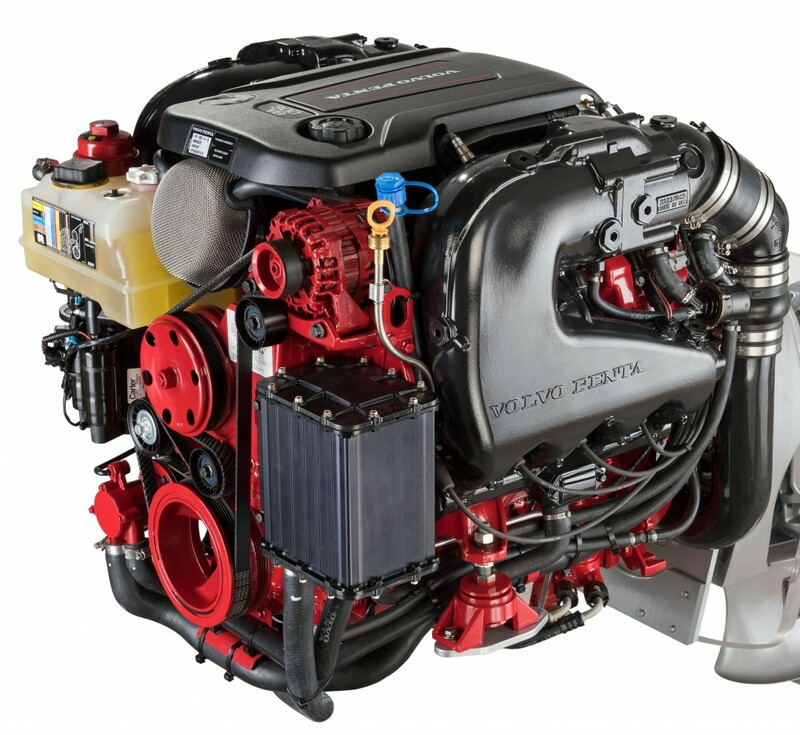 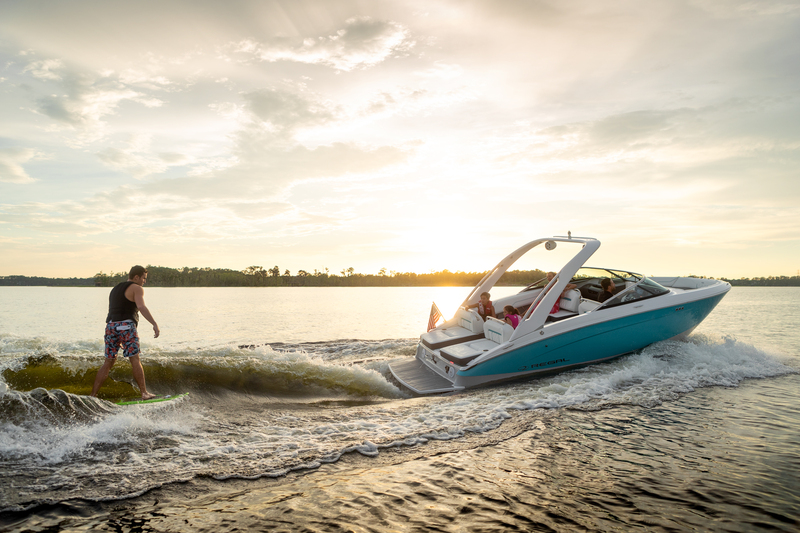 the LS4 Surf offers the best of both worlds. 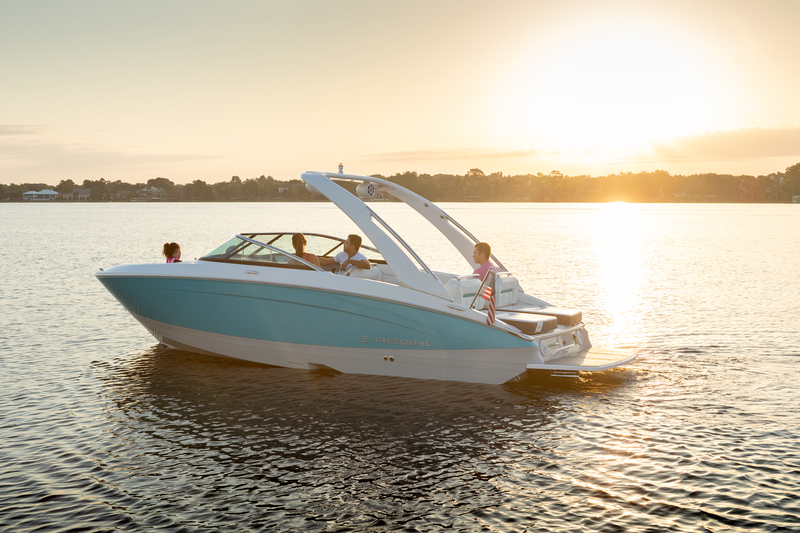 Crafted for making every experience on the water unforgettable. Incredible styling. 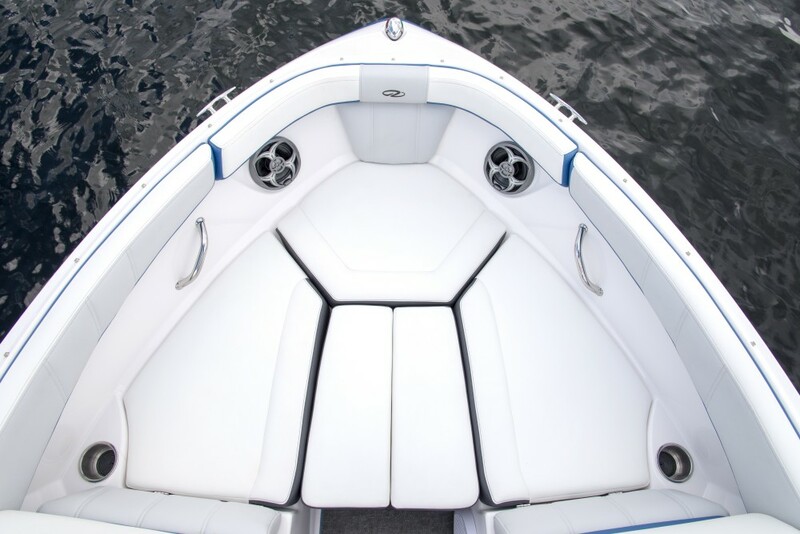 Incredible spaciousness. 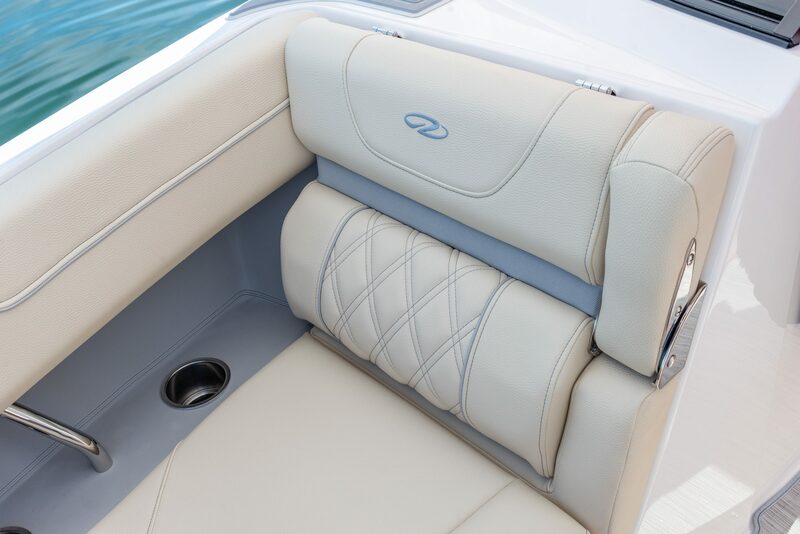 Incredible comfort. 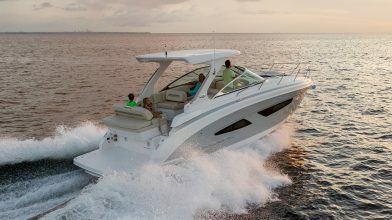 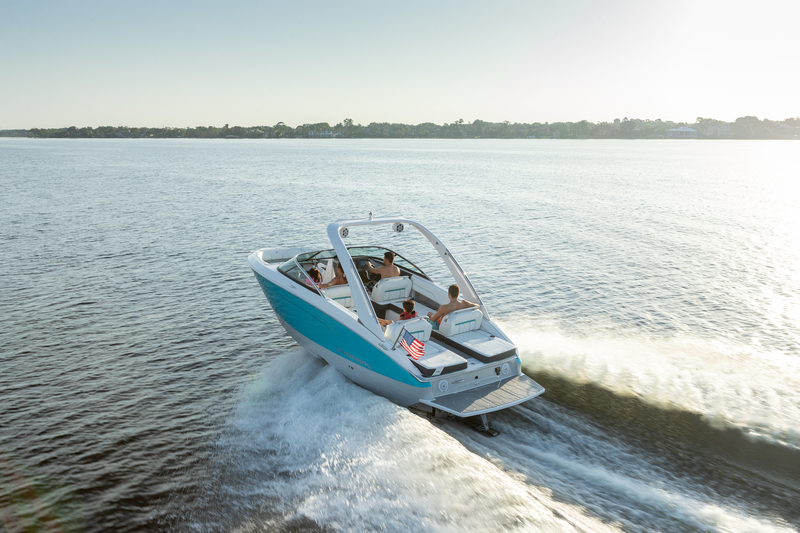 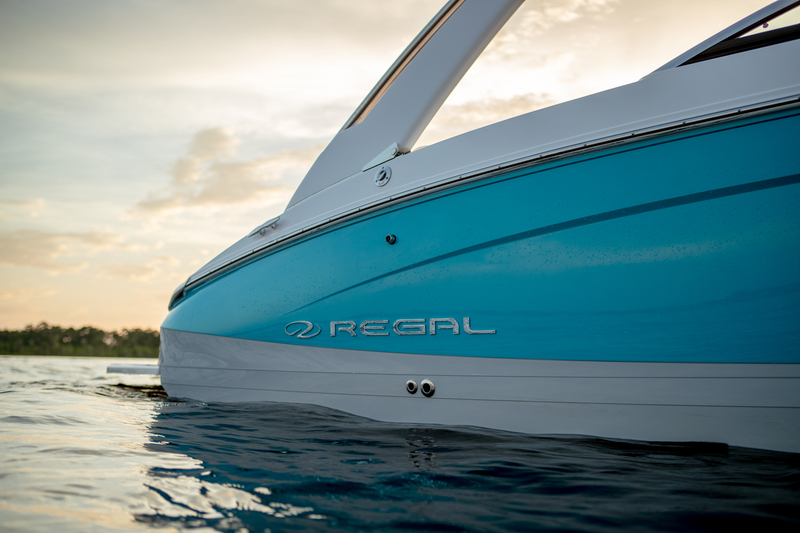 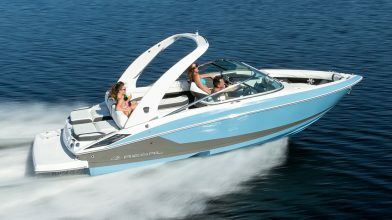 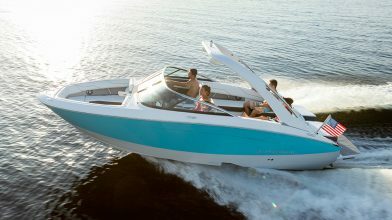 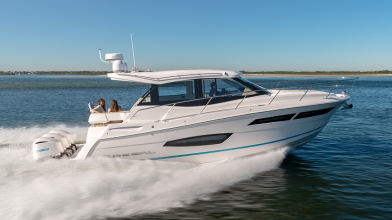 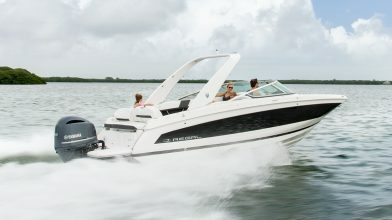 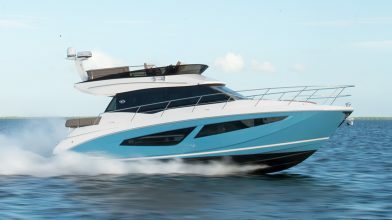 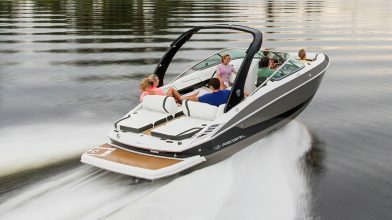 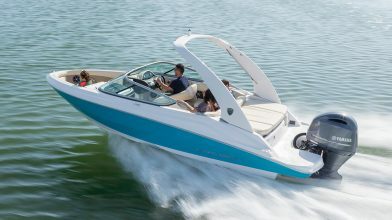 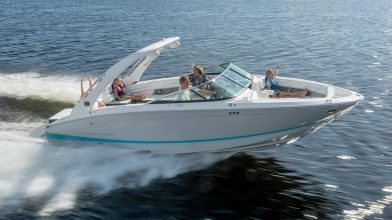 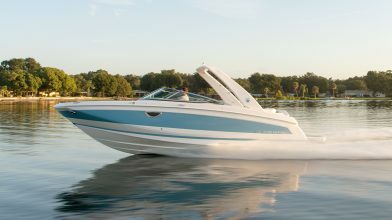 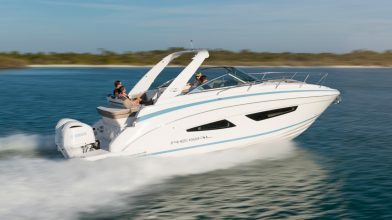 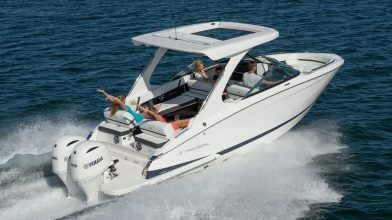 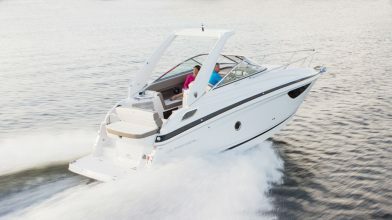 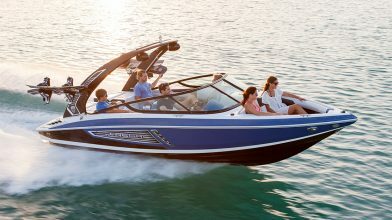 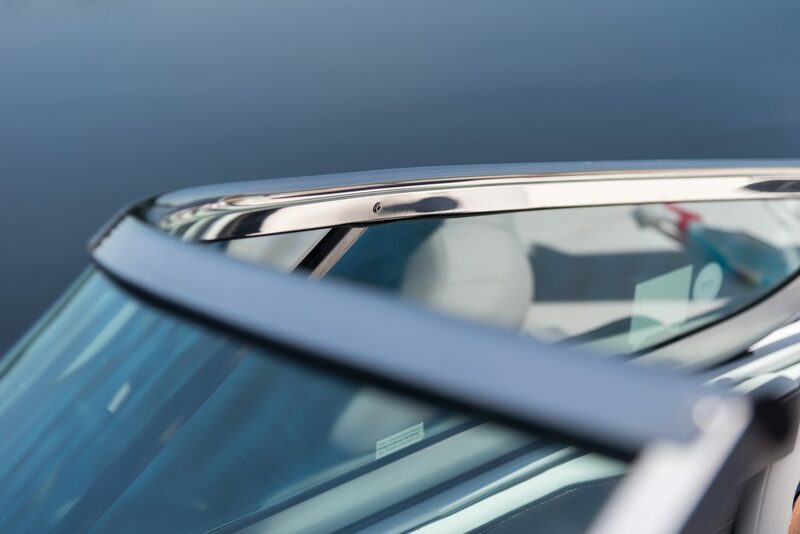 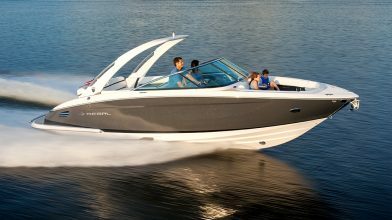 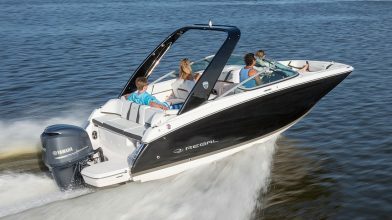 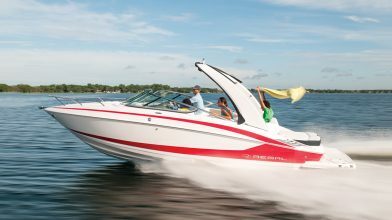 The Regal Surf System combines wave shaping tabs, 2,000 pounds of ballast, Volvo's Forward Drive, and a touch-screen Water Sports display for the ultimate endless wave. 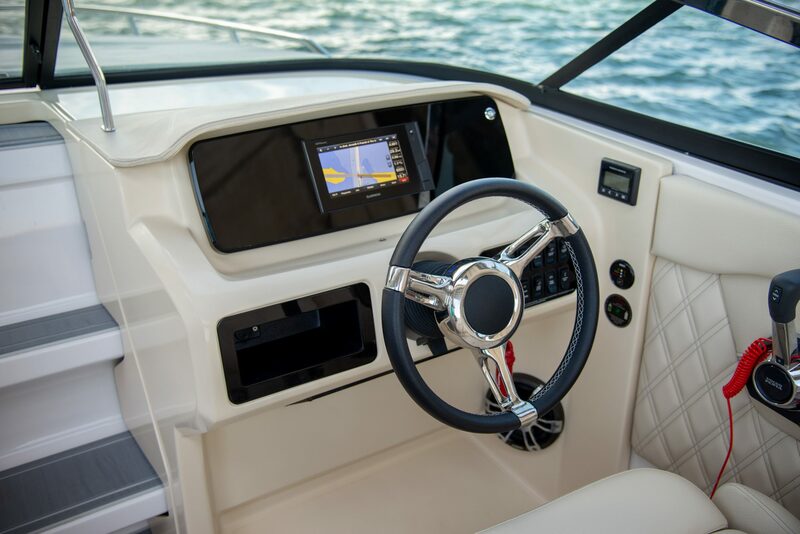 Upgrade your dash and your experience with the dual Garmin displays available at the helm. 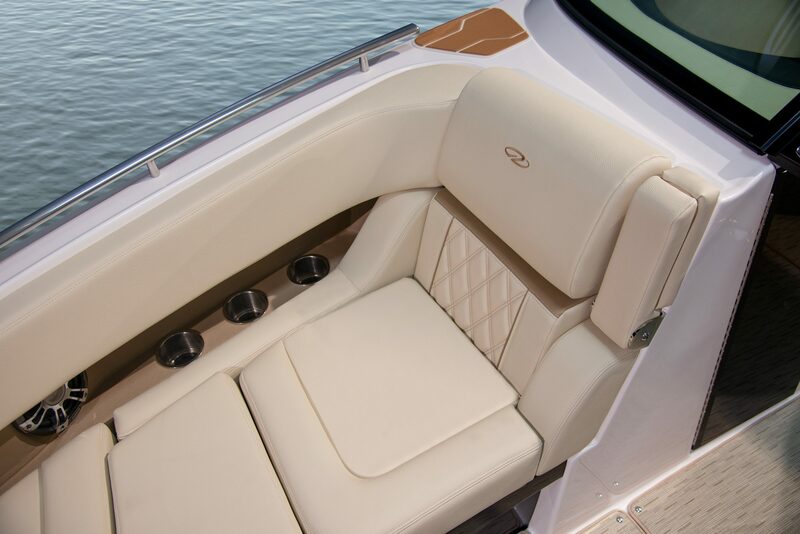 The cockpit seating boasts unmatched craftsmanship in its details and unrivaled comfort to match. 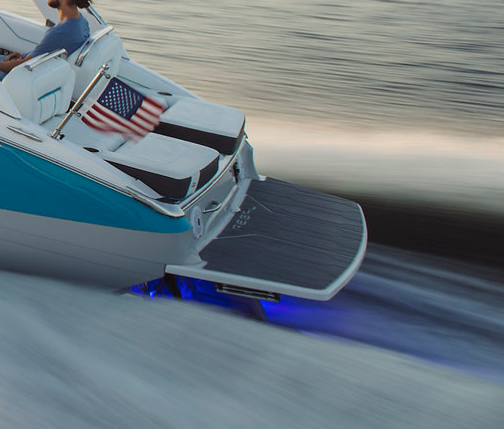 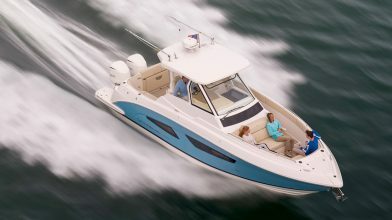 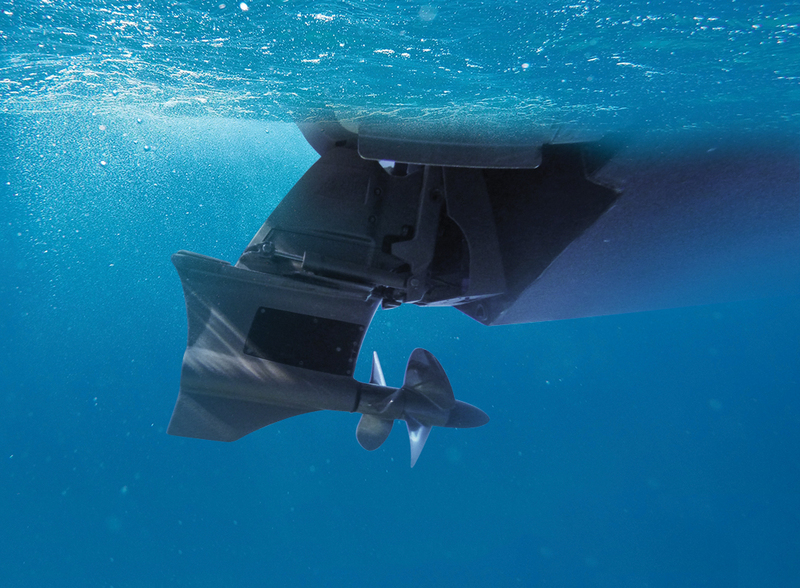 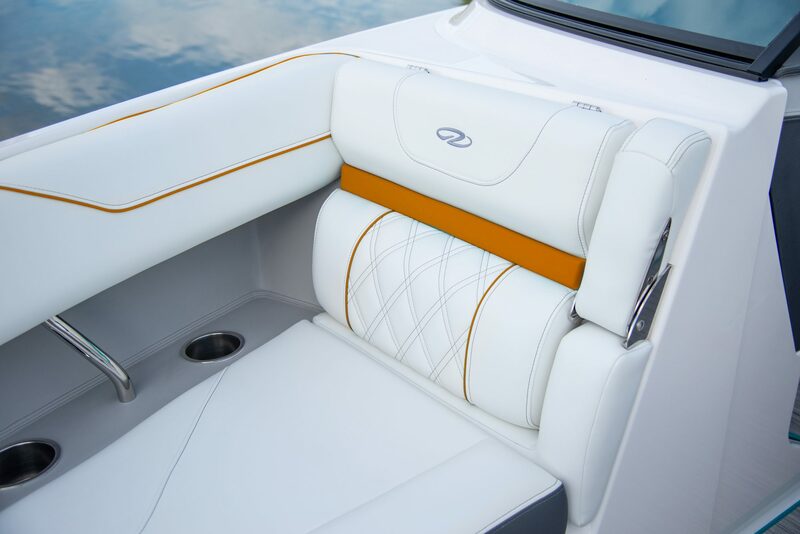 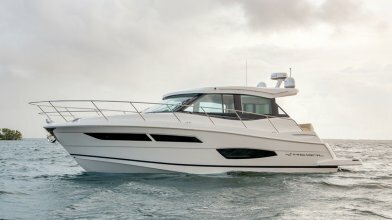 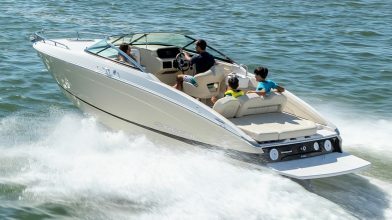 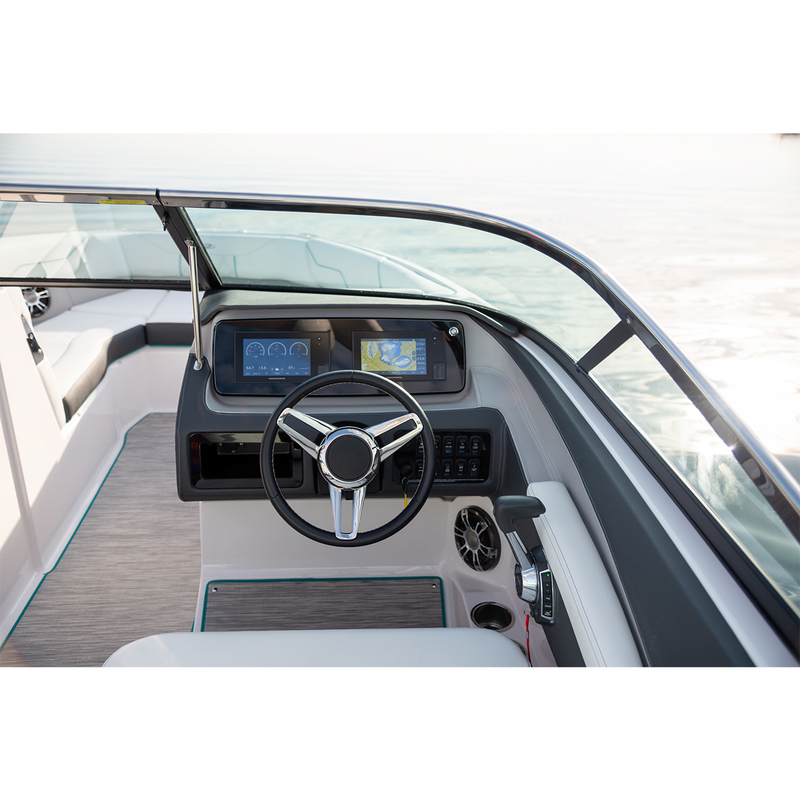 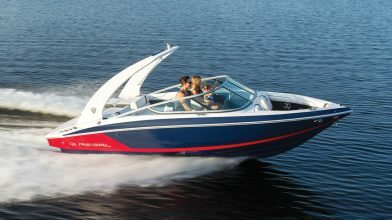 The LS4 features the most versatile transom in its class with not only dual multi-position UltraLounges and a low-to-the-water swim platform, but also two fold-away rumble seats. 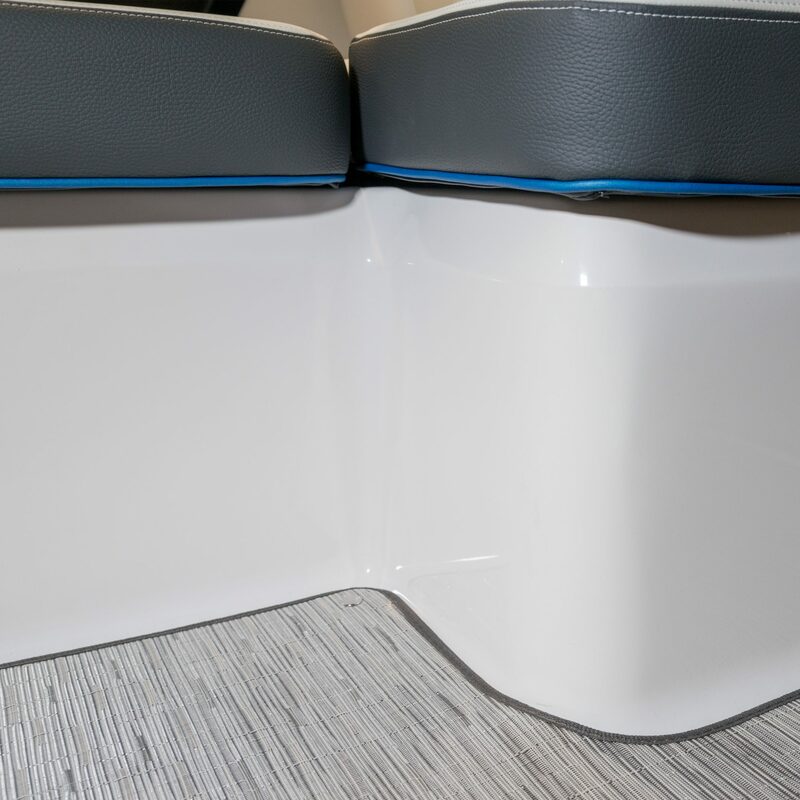 A completely reimagined and redesigned cockpit layout to provide 31% more storage capacity, 11% more seating space, and a six inch wider interior beam when compared to similar sized models. 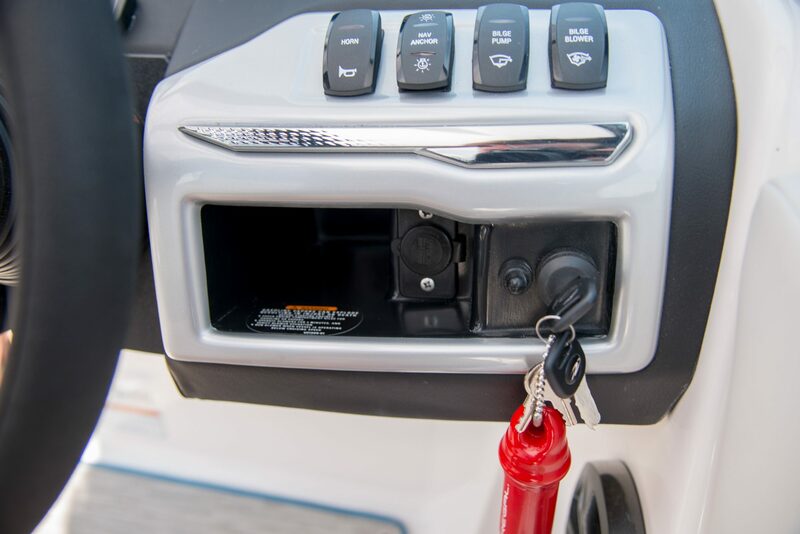 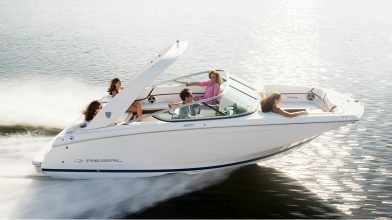 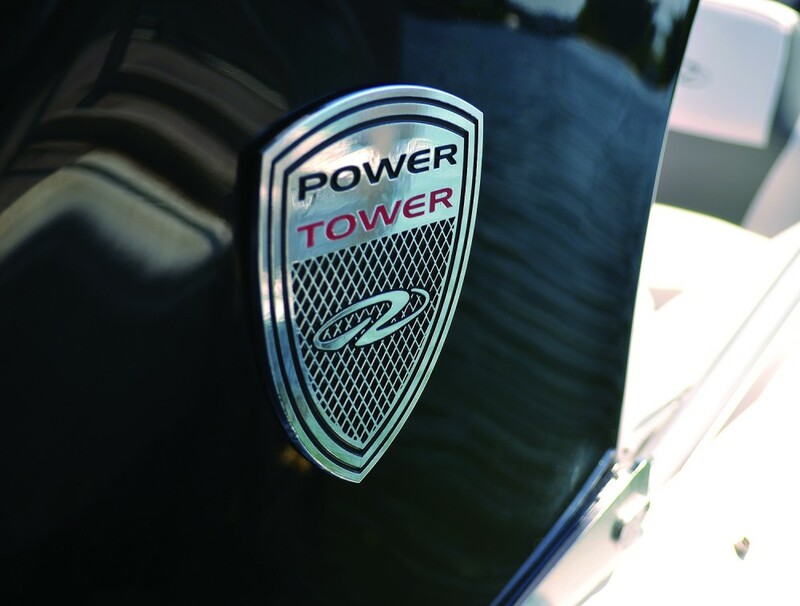 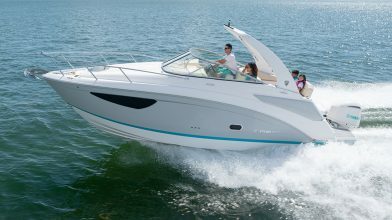 For worry-free boating, the battery charger is a must. 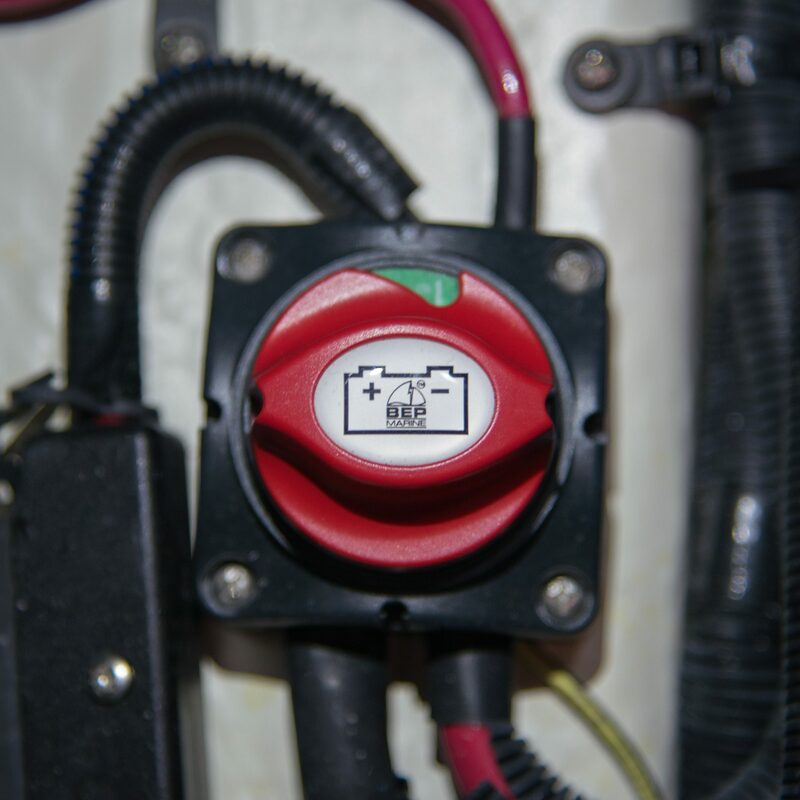 No need to be concerned with batteries being up to capacity. 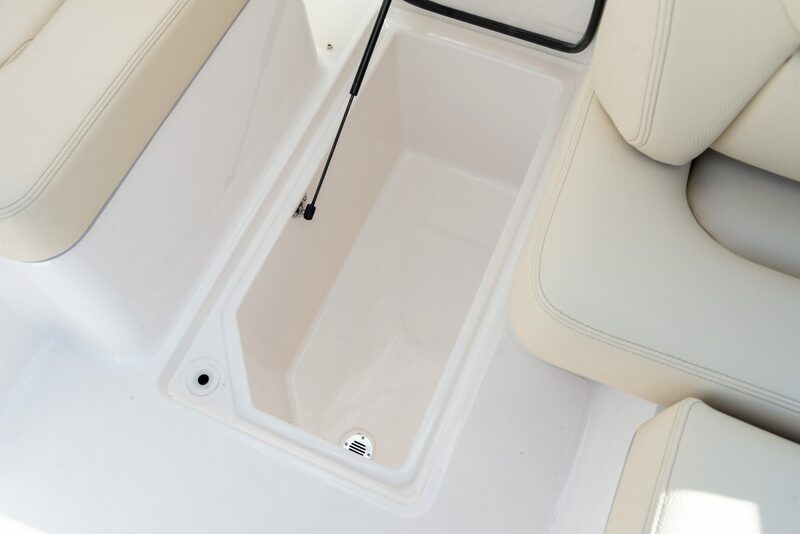 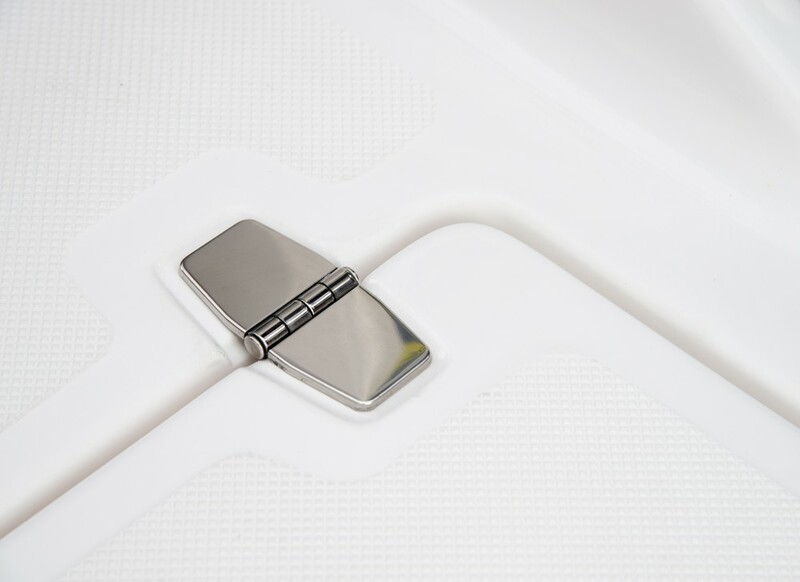 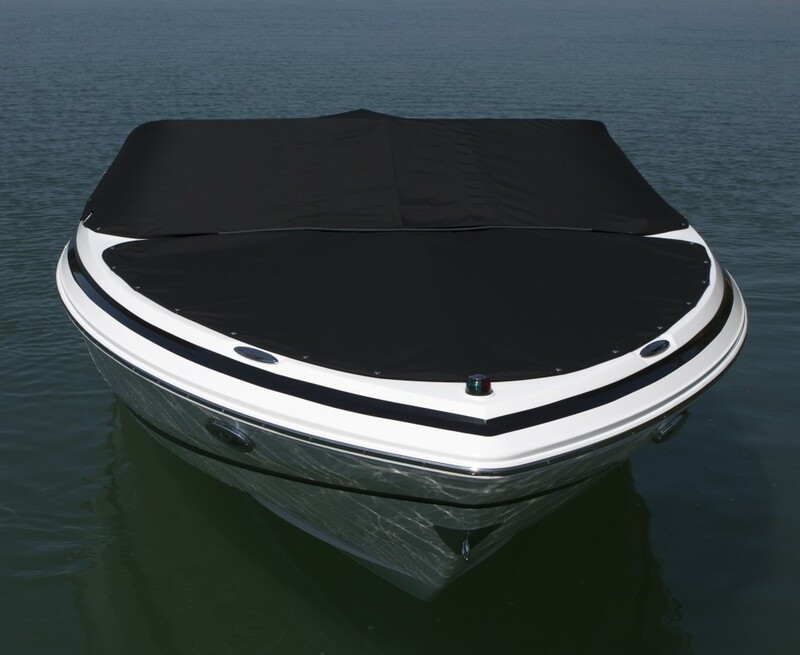 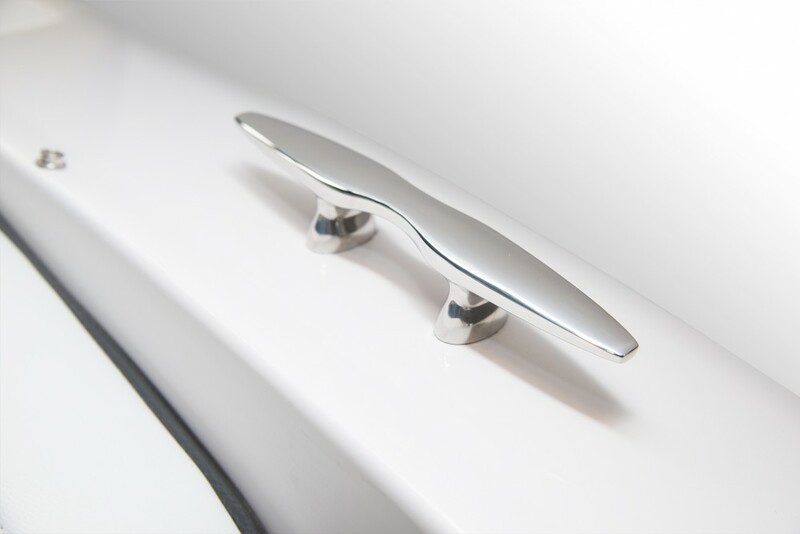 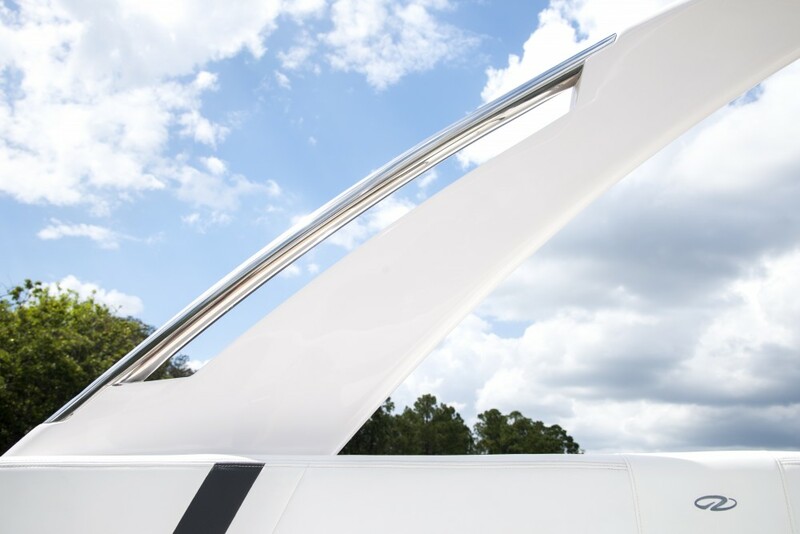 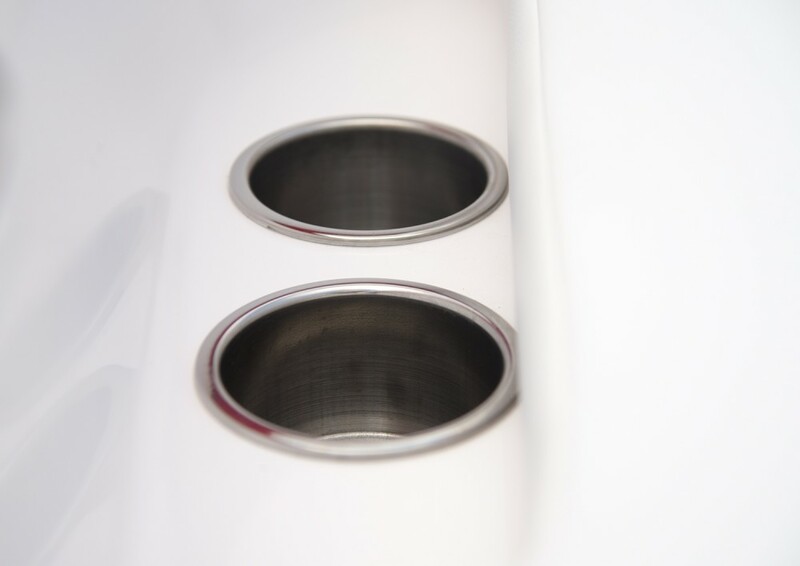 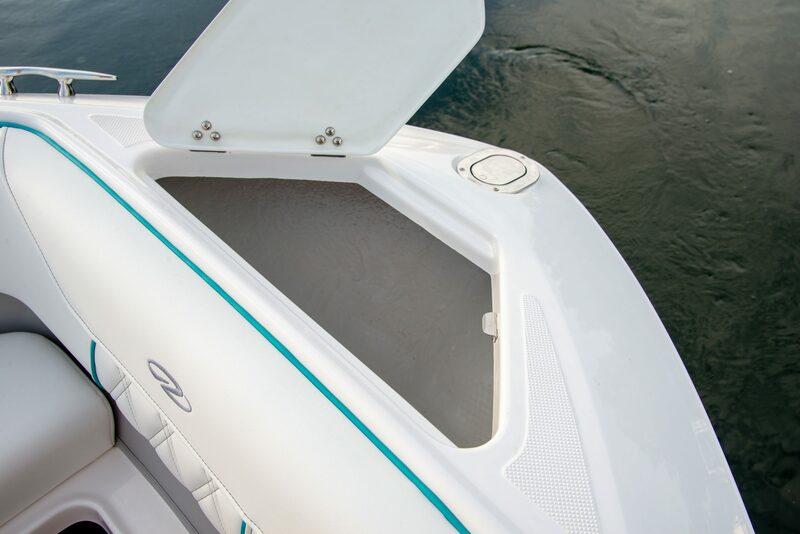 The bow and cockpit covers keep your boat clean when not in use. 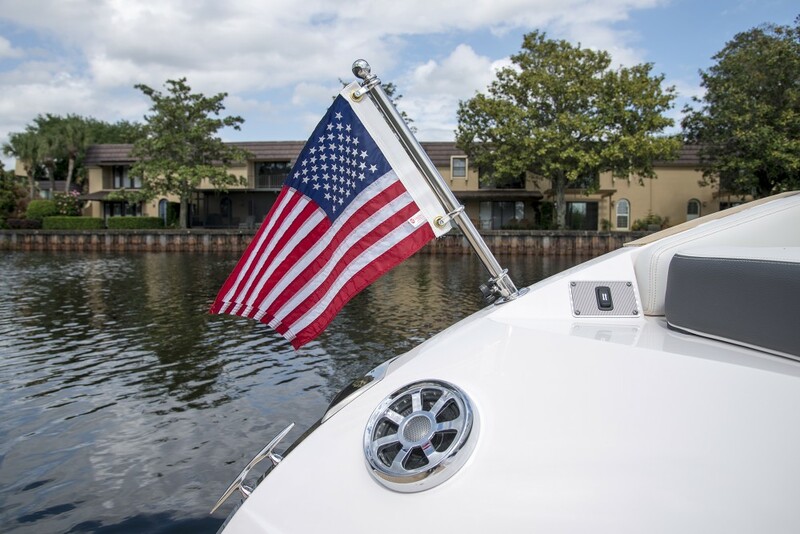 The stainless flag pole is a great way to represent any nation. 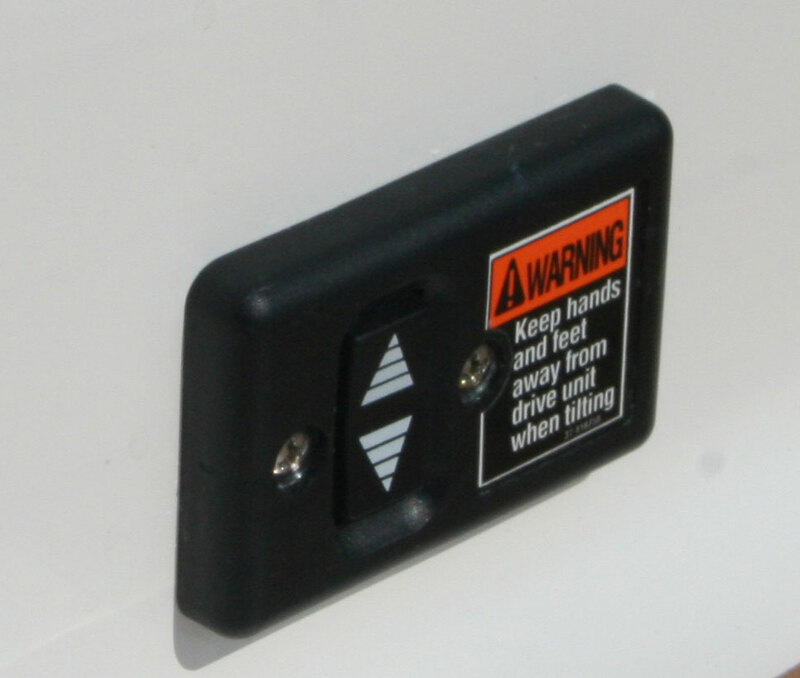 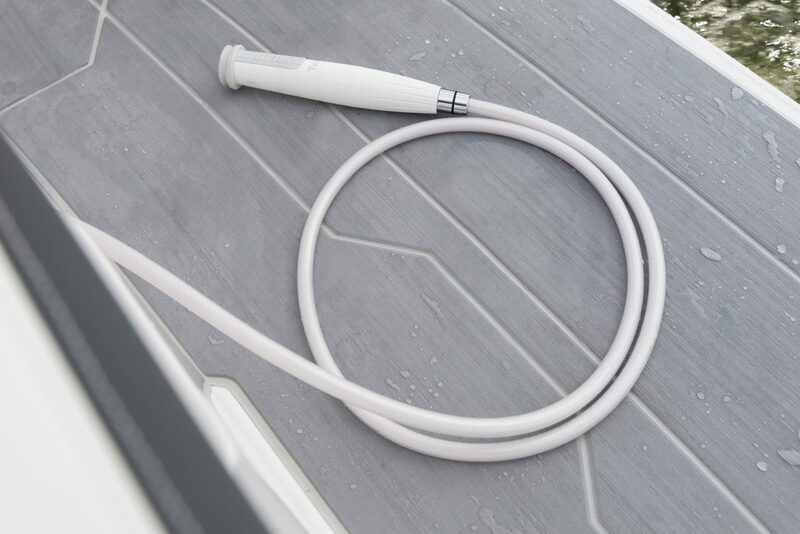 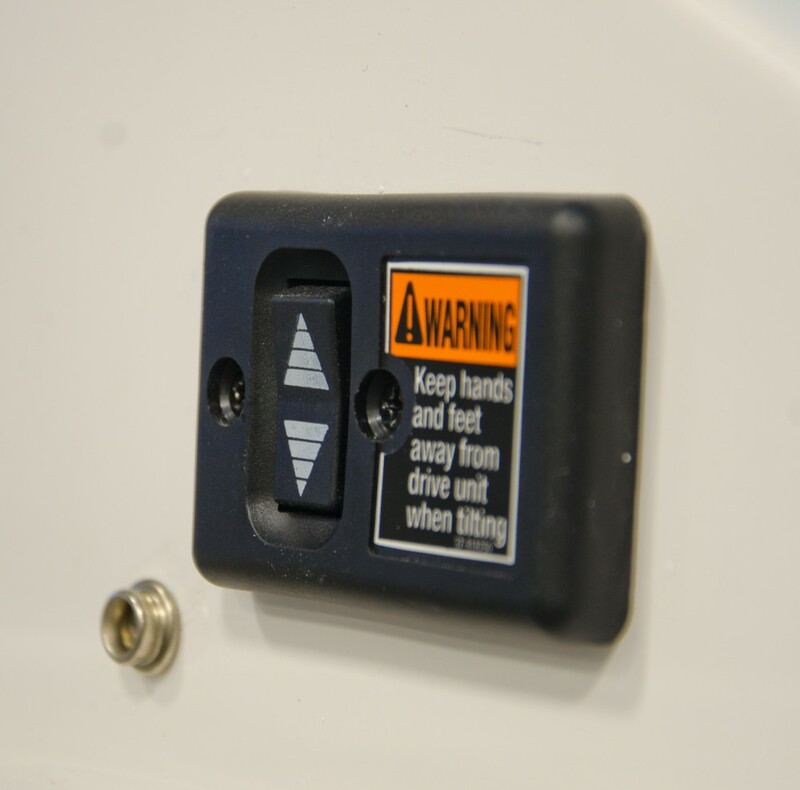 The automatic bilge pumps take action before you even realize you need them. 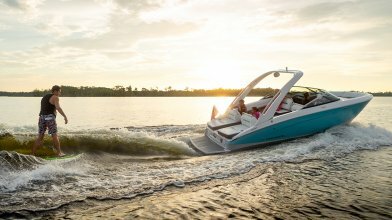 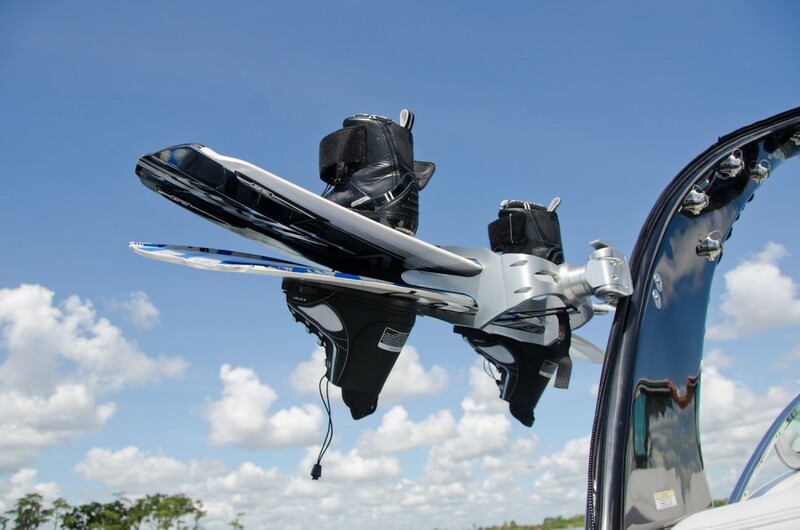 Whether wakesurfing, wakeboarding or cruising, Forward Drive allows boaters to enjoy endless days of fun with extreme versatility. 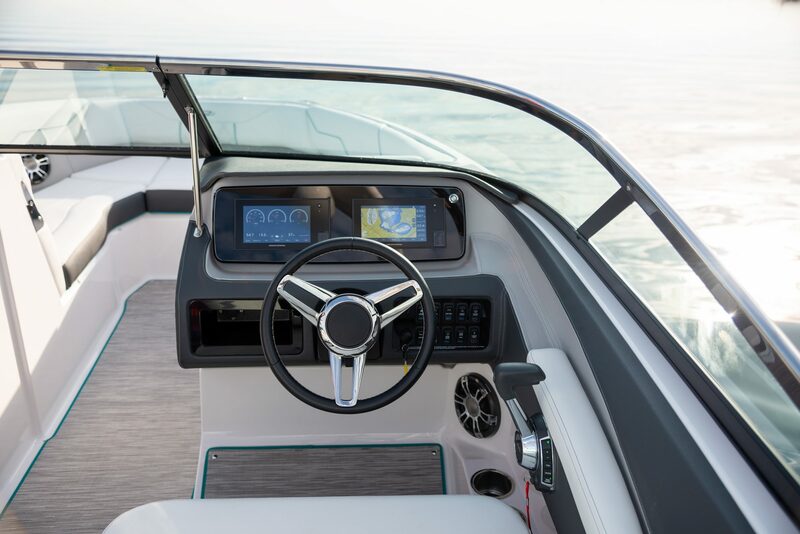 At the helm, the Captain enjoys both maximized space and comfort. 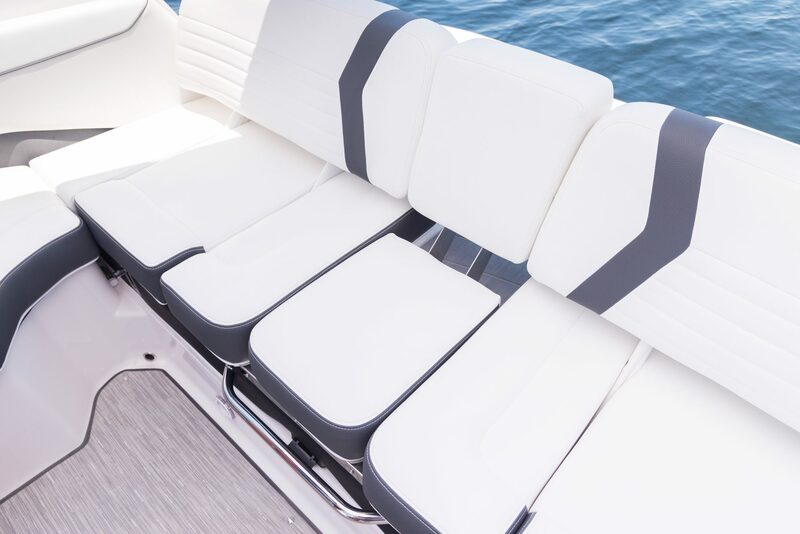 The multi-position seat converts from a cockpit lounger to a forward facing seat big enough to share with just a flip of the backrest. 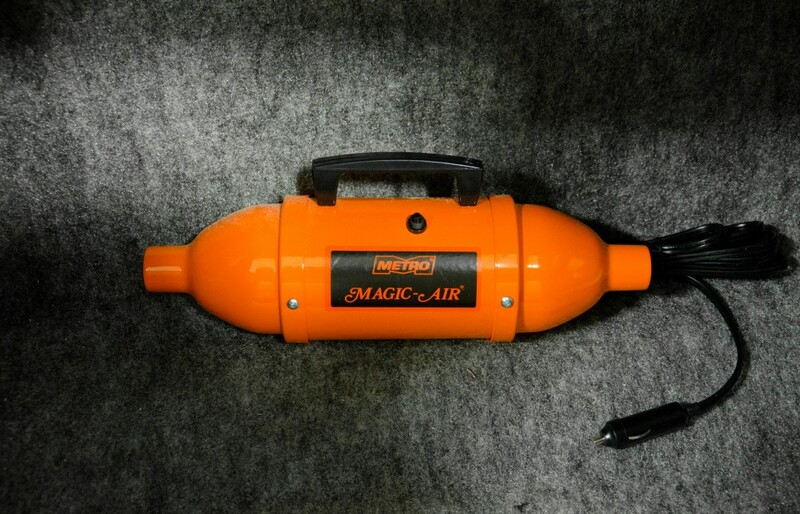 The best sound begins with the best equipment. 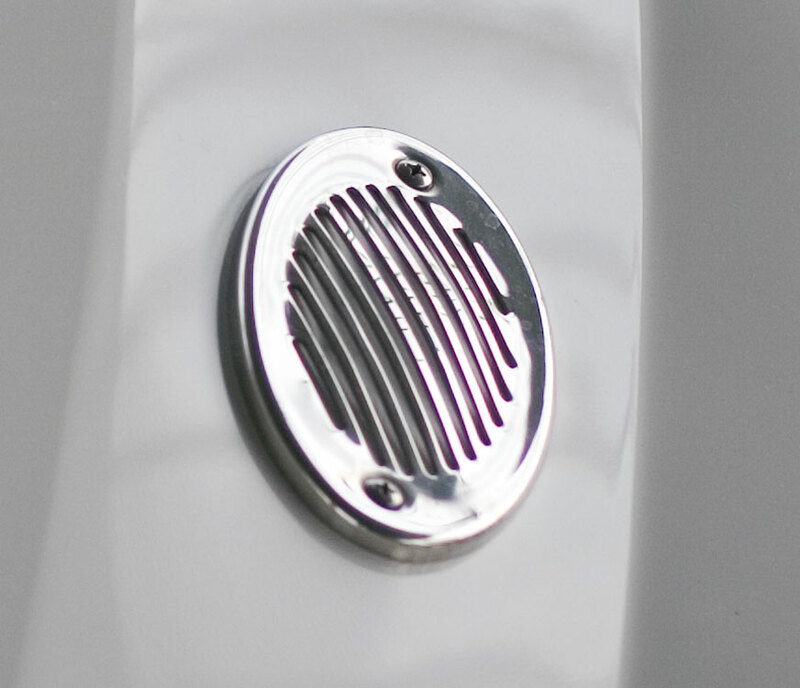 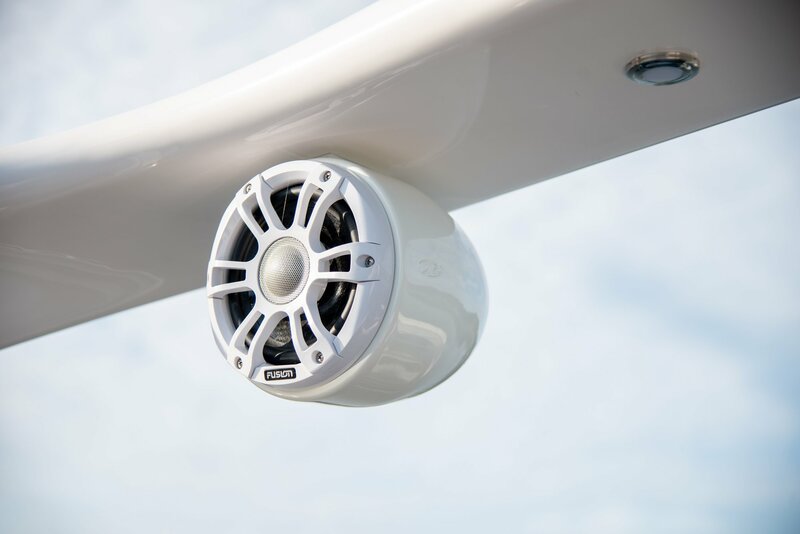 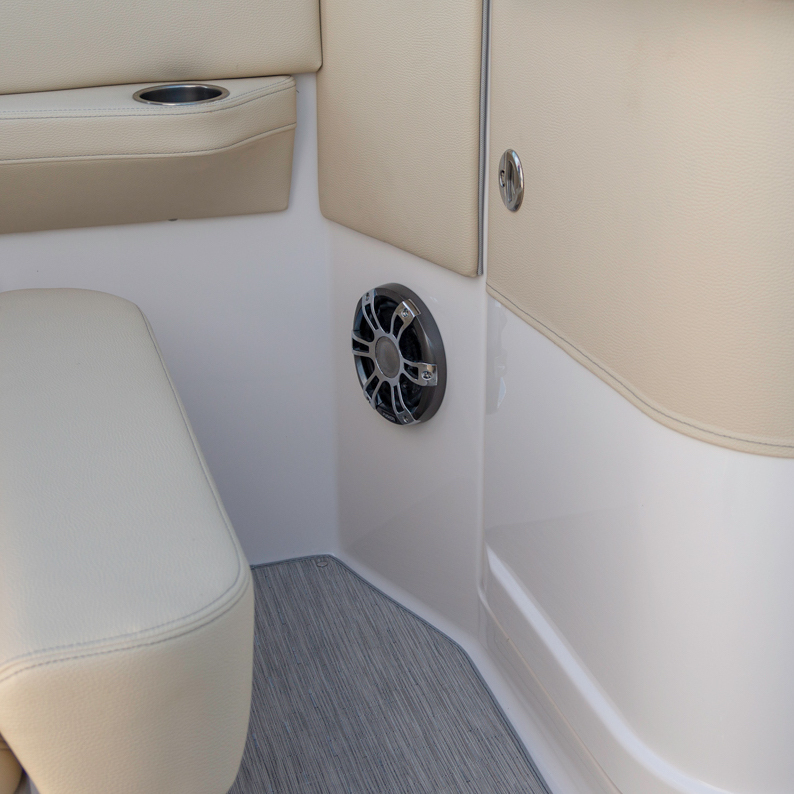 Set the atmosphere with the perfect soundtrack with the help of six 200 watt cockpit speakers with an IP65 waterproof rating. 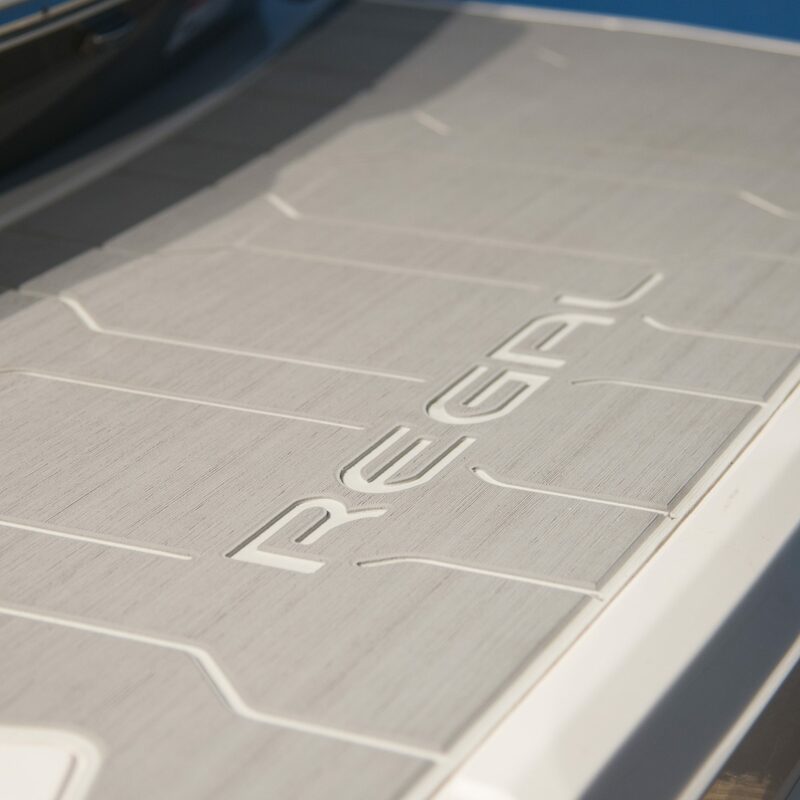 The Regal LS4 boasts unmatched craftsmanship in the details and unrivaled comfort to match. 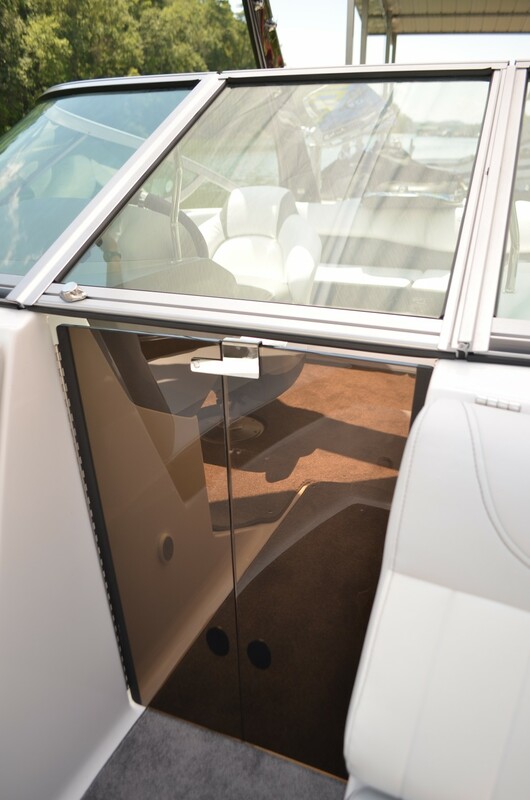 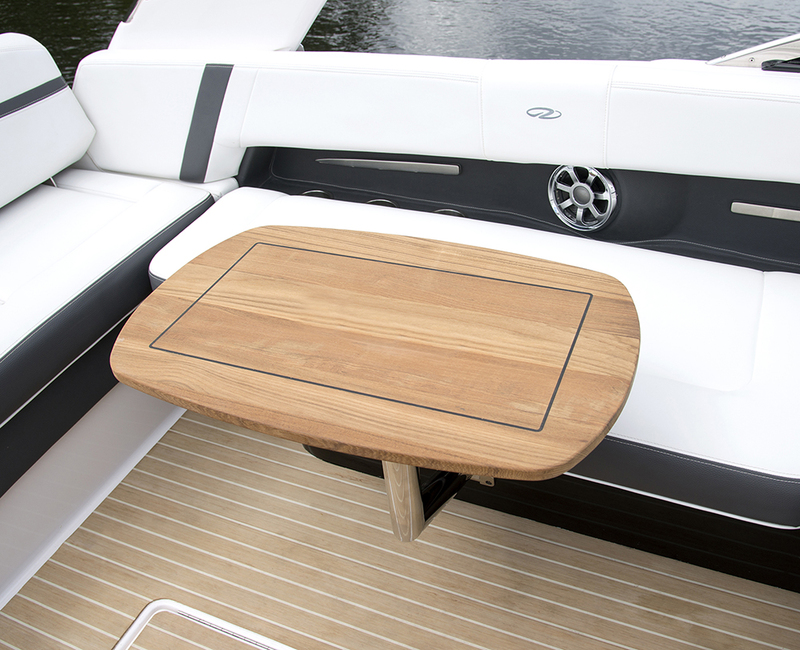 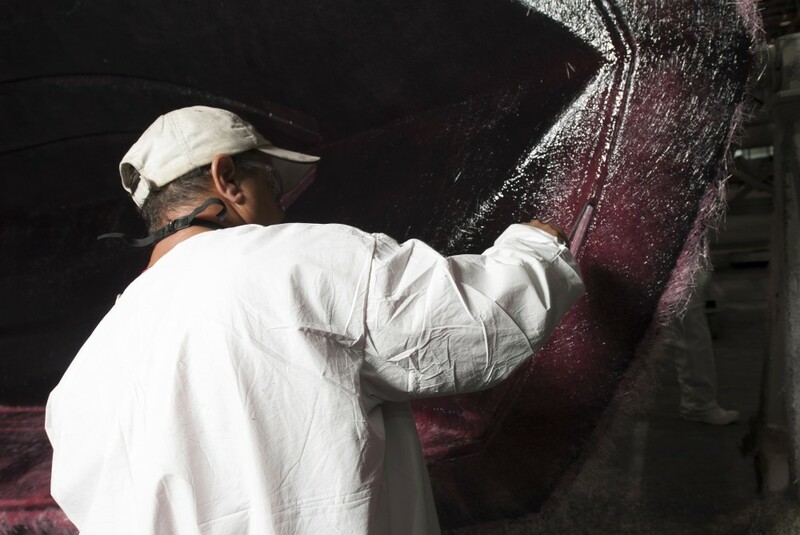 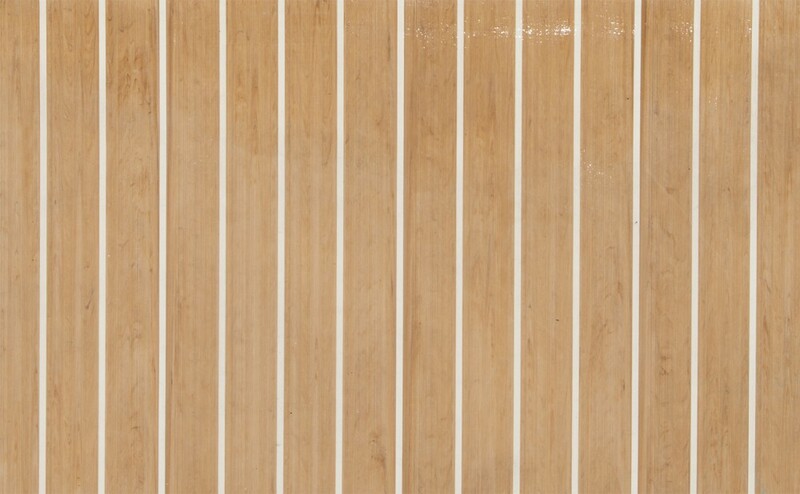 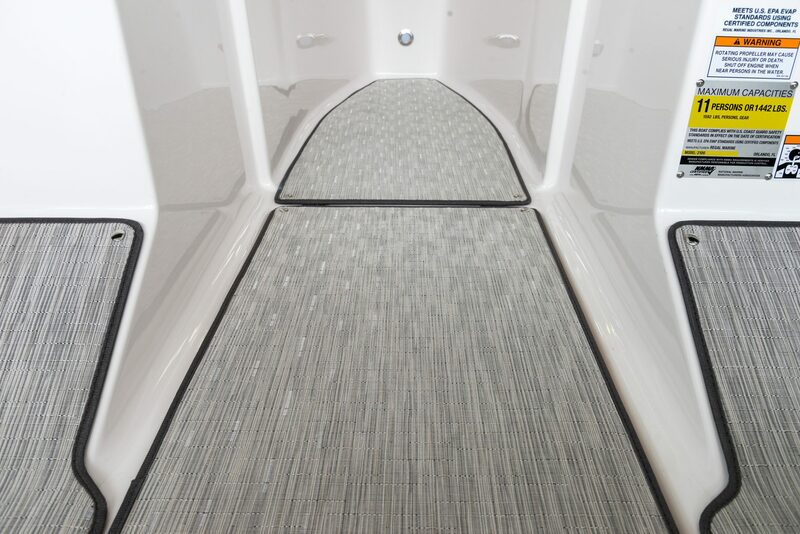 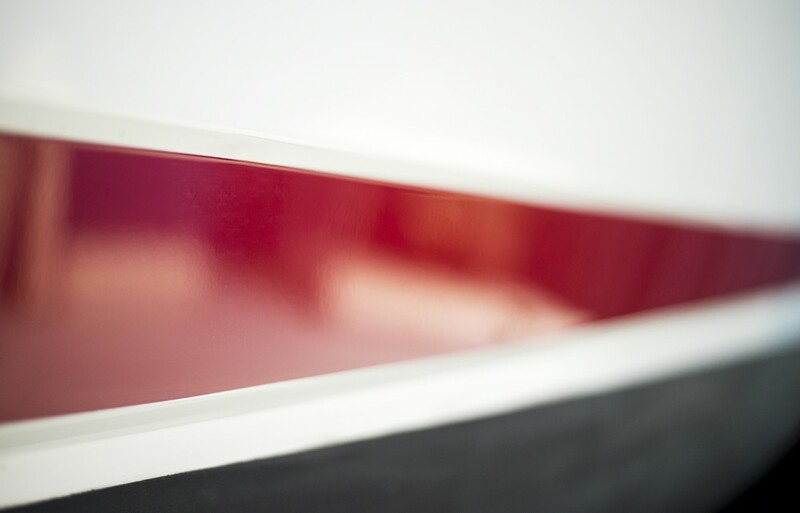 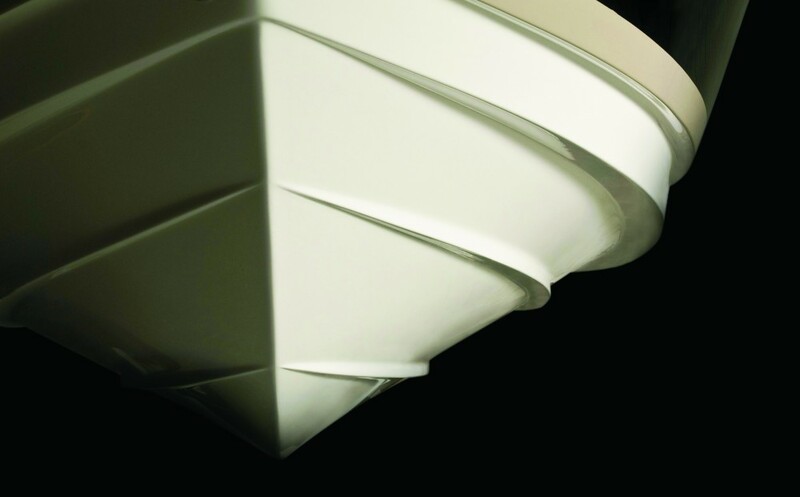 The transom walk-thru makes boarding easy and keeps the upholstery clean. 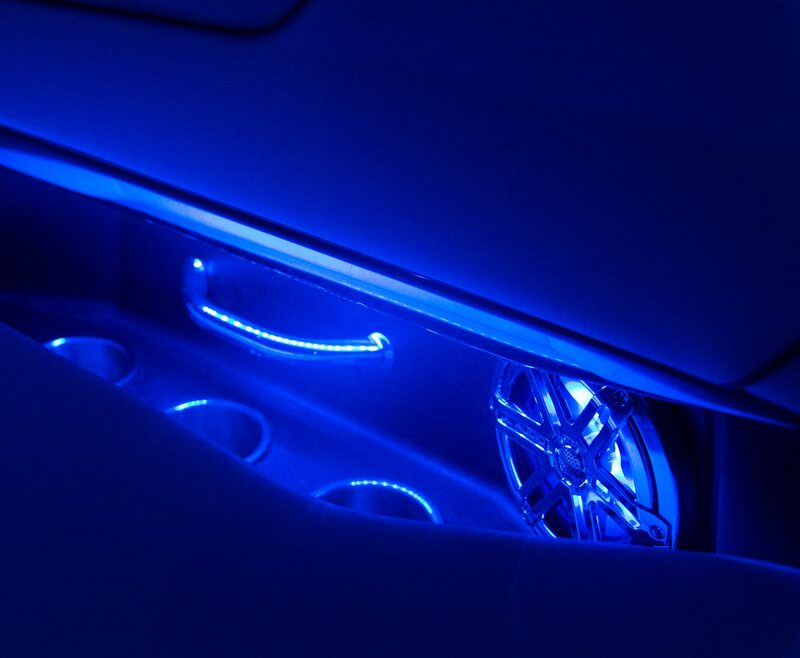 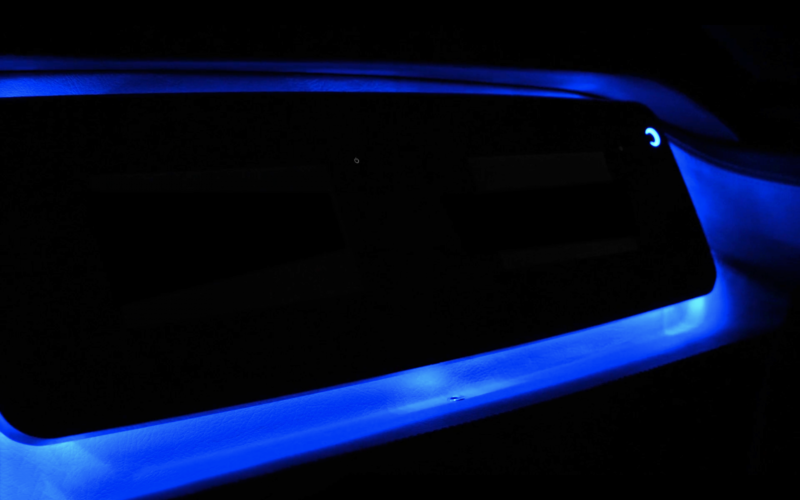 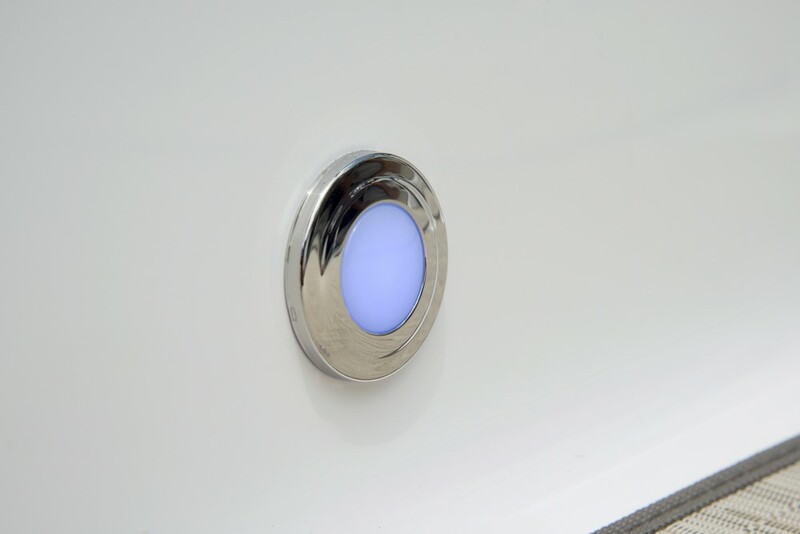 Illuminate your dash with just the push of a button. 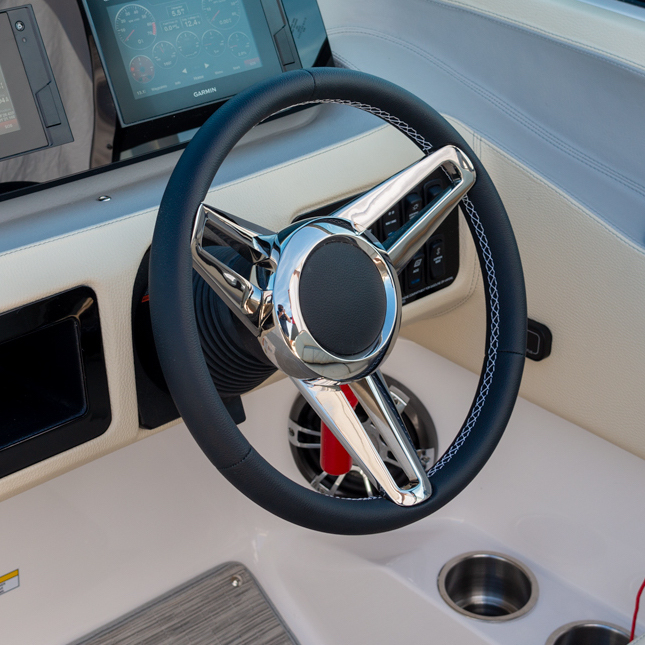 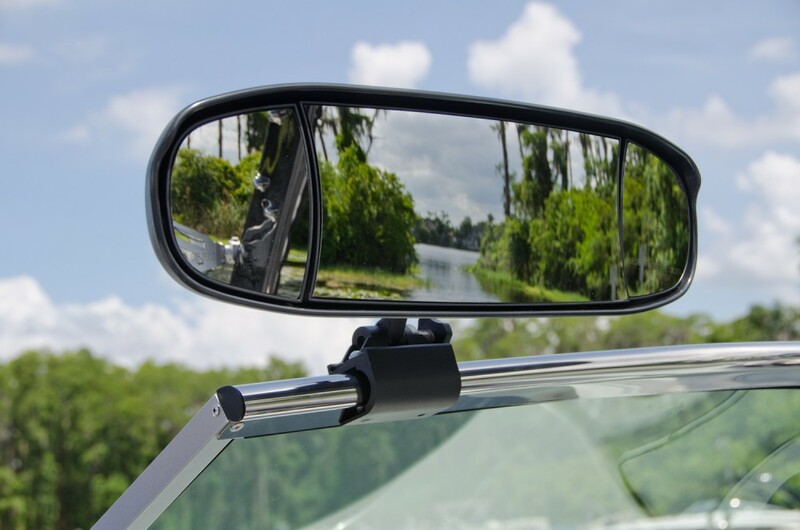 Get the most out your helm with the dual Garmin displays. 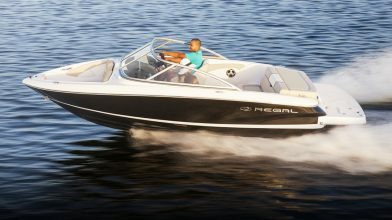 Regals feature a premium hand-wrapped steering wheel for the utmost comfort and control. 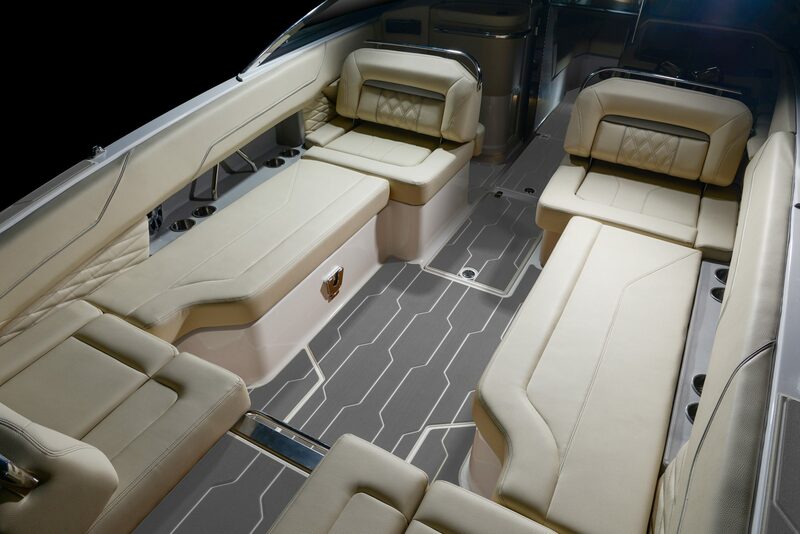 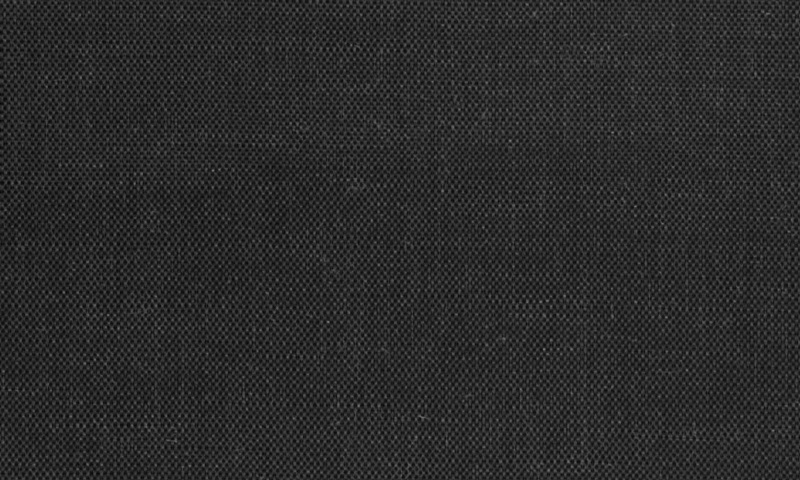 Hand-wrapped, hand-stitched vinyl meets sleek metals to please the hand and eye. 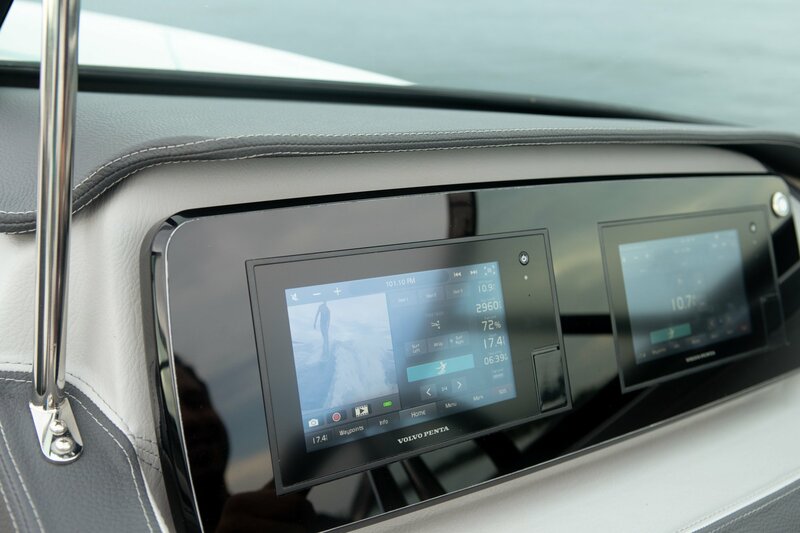 The Garmin 742 navigation system is equipped with a high-resolution 7-inch touchscreen with all of its intuitive controls at your fingertips. 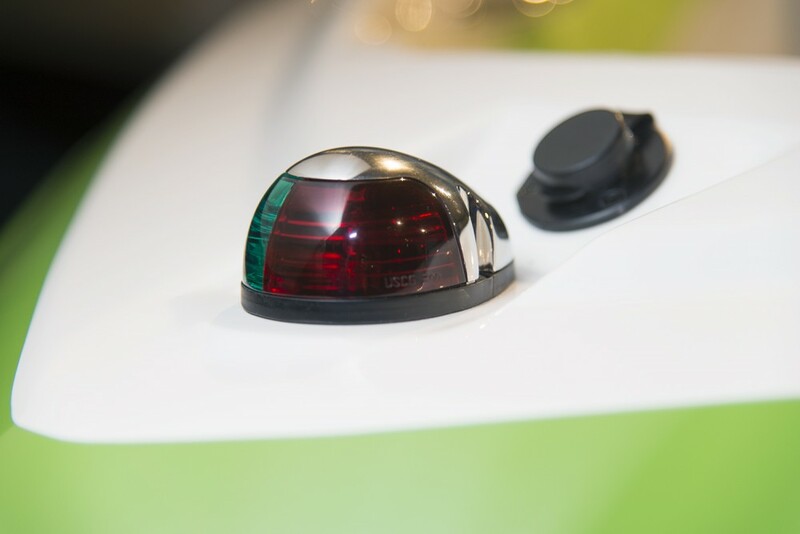 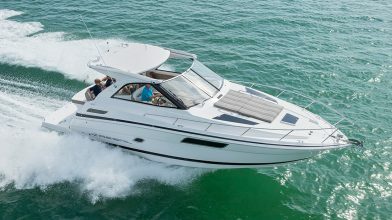 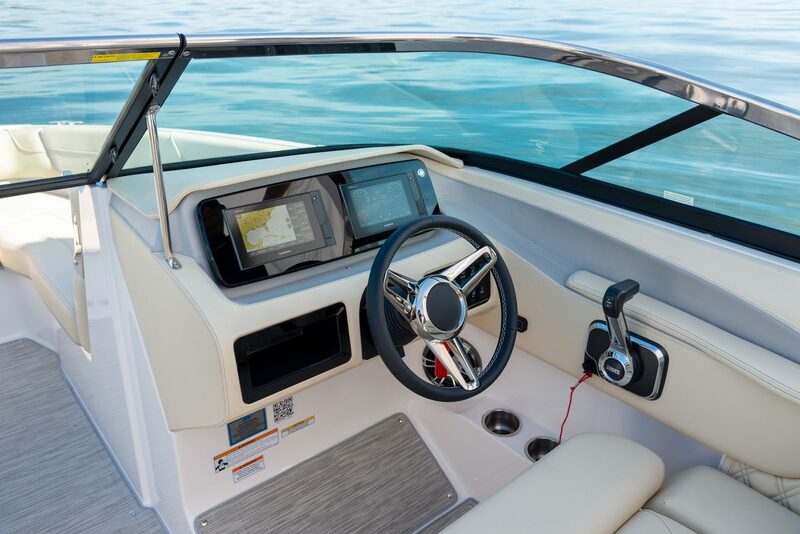 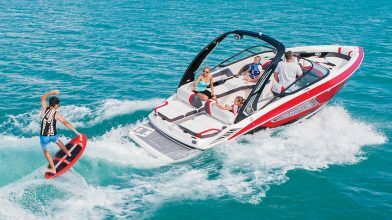 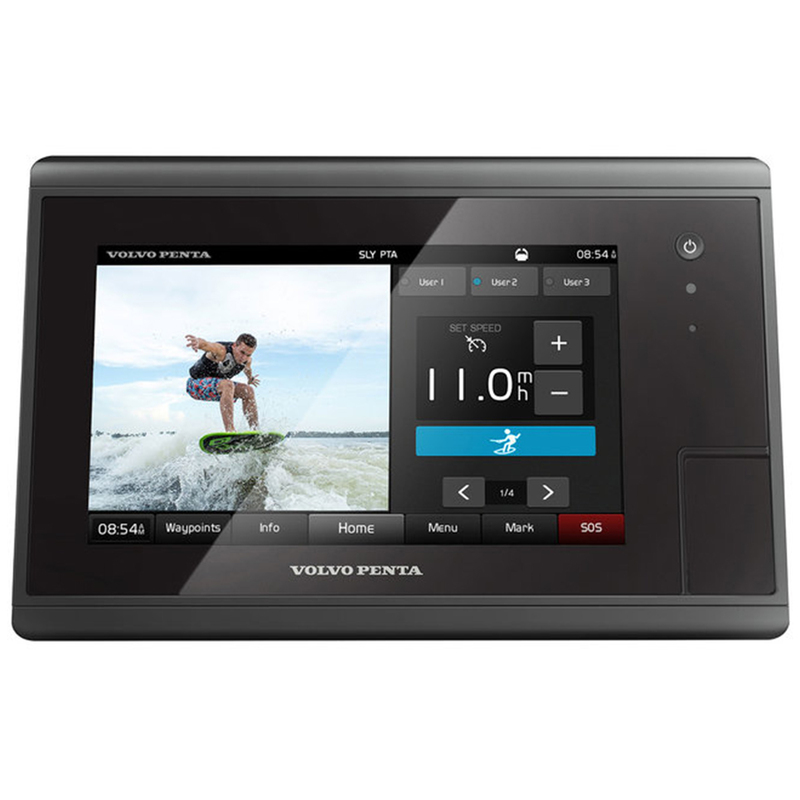 Choose your speed, fill your ballasts, pick a wave direction, and deploy the tabs all with just a few taps on the touchscreen display. 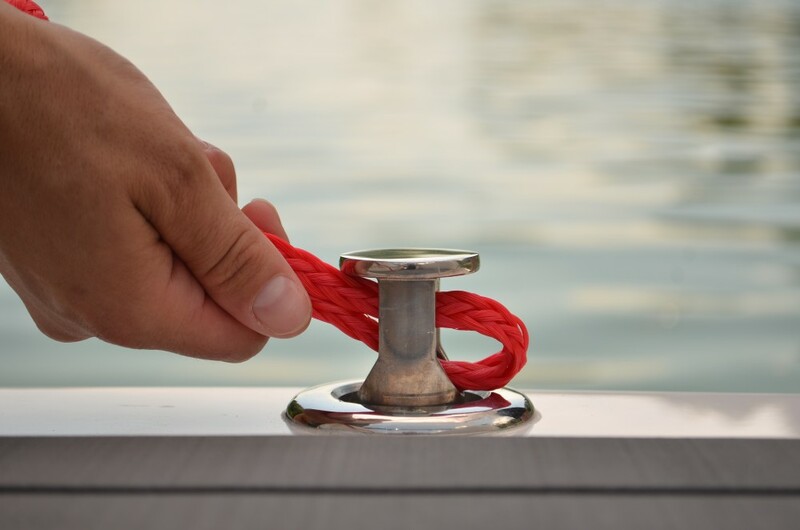 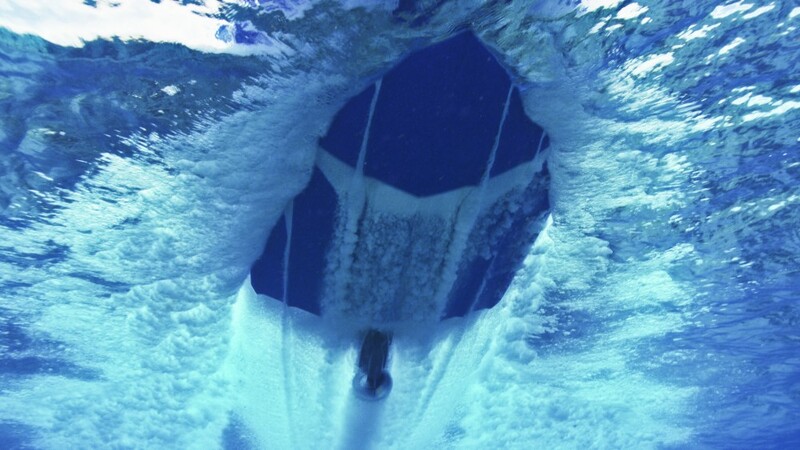 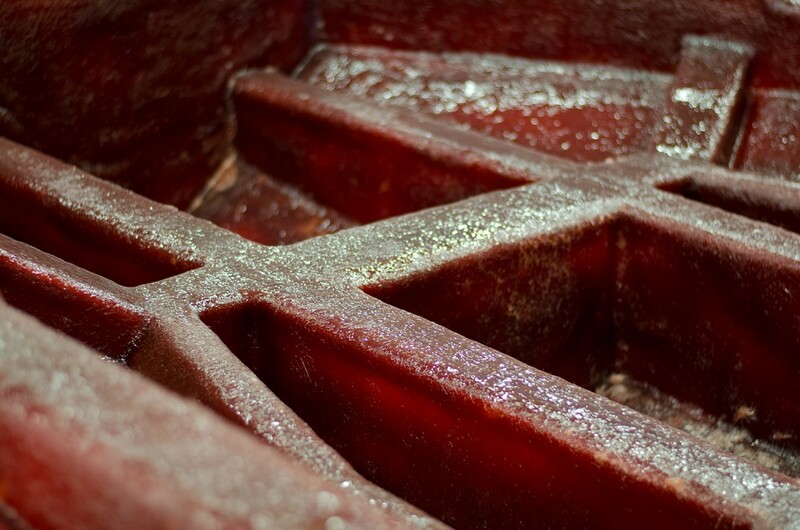 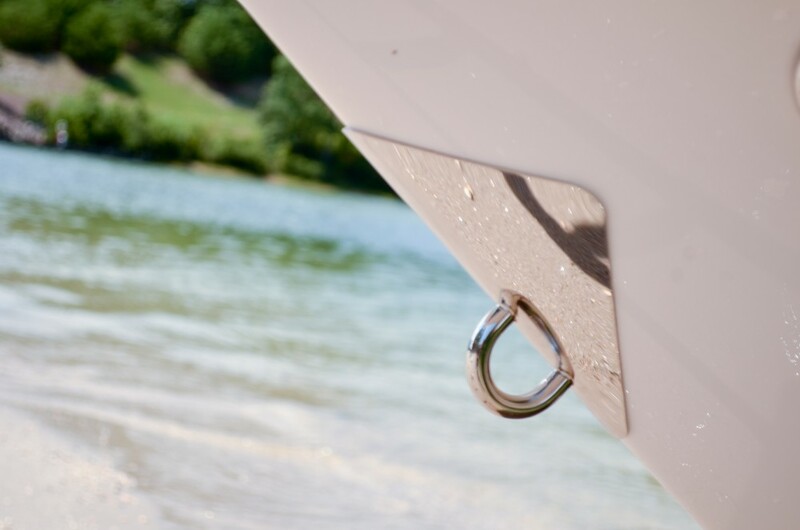 A dedicated bow anchor locker will keep you from dragging a wet anchor through the boat. 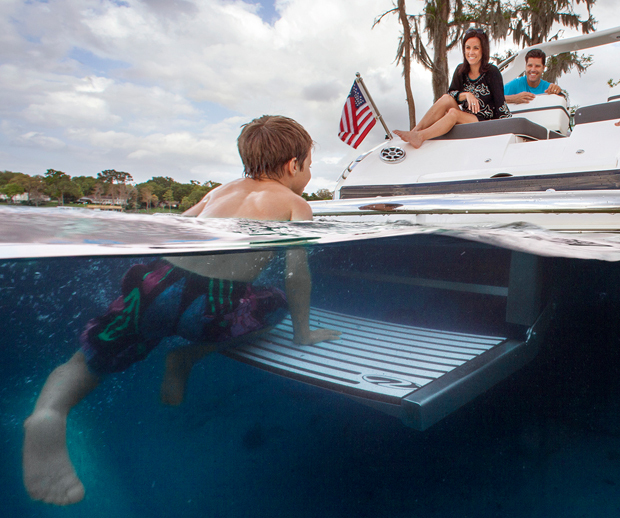 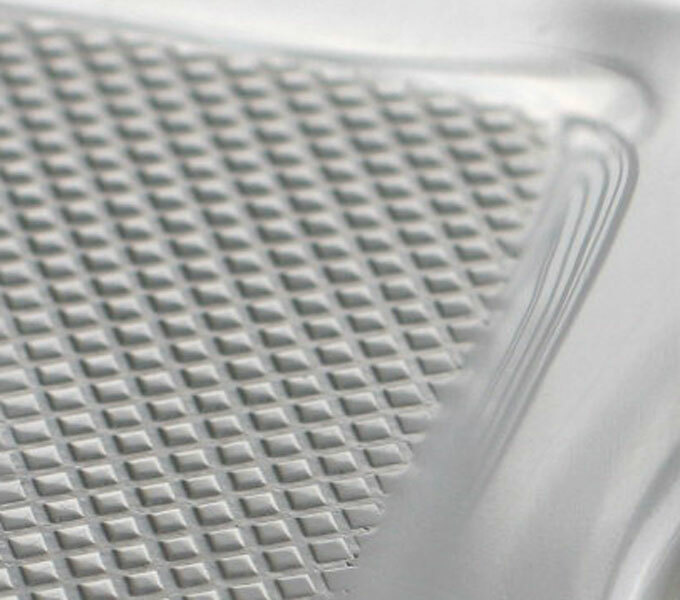 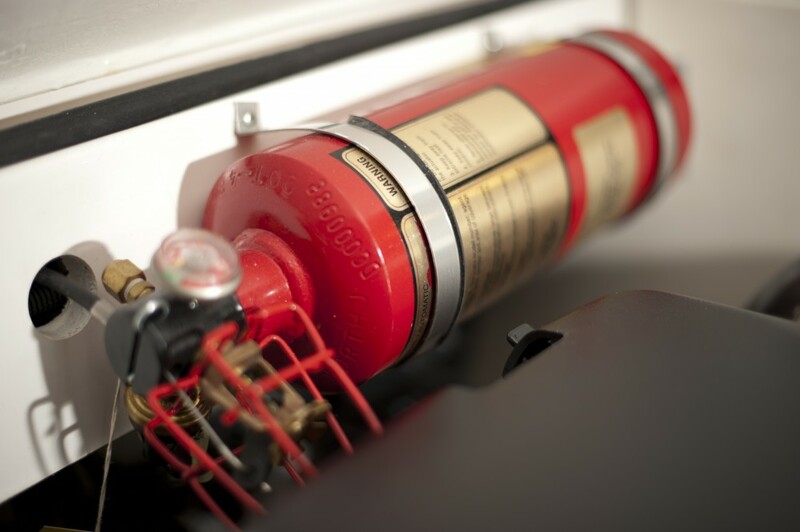 With the touch of a button, gently submerse the platform underwater for easier water and boat entry. 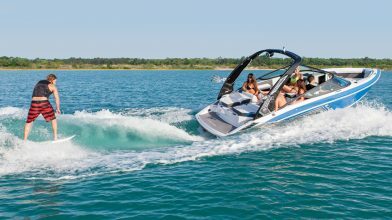 Capable of offering both luxurious leisure and thrilling adventure, the LS6 is the ultimate balance of beauty, innovation, and versatility.